The Year of New Editions comes in all forms. We've got new card games, new board games, and new RPGs. This includes companies who are putting out simply revised versions of their books. As an editor, a good revision can be just as much to work out as a new edition. No, a lot of rules don't have to change in order to make a game much tighter. 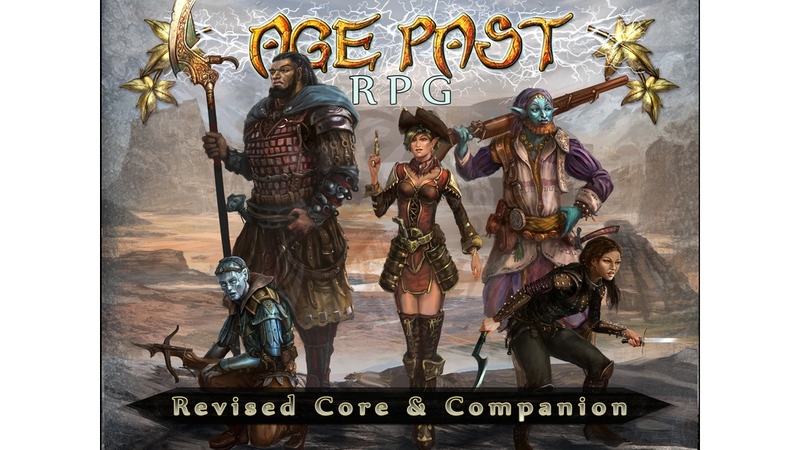 Age Past: The Incian Sphere revised core and companion books are up on Kickstarter now. For those that don't know, Age Past uses a unique RPG rules set that takes the constraints off of character creation. There are no classes. You can just pick whatever power, spells, factions, crafting skills, pets, and companions as desired (well, not all at once, that'd be overpowered. But you know what I mean). The characters you play are also basically legendary creatures. They've lived long lives, done many great (and sometimes terrible) deeds, and are known to have left a mark on the world. This drives the story forward, as new challenges are placed before them, you must weigh your options versus what history has said of you already.